I started CrossFit shortly after falling centimeters short of competing in the 2008 Olympics for hammer throw. I realized I couldn't accept losing the physical abilities I'd spent my life to that point building. 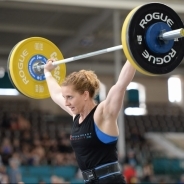 Since starting CrossFit in 2010, I've eclipsed every PR I ever set as an Olympic hopeful (except the hammer throw specifically, I suppose), and am stronger both physically and mentally than I ever thought possible. My husband and I opened Arena Ready CrossFit in 2012 because we wanted to make a difference in our little part of the world, and we continue to be amazed by how effective CrossFit is in helping people to find the best versions of themselves.